“Diggi-Loo Diggi-Ley” by the Herrey’s won the European Song Contest in 1984. Herrey’s was a Swedish band with the 3 brothers Per Herrey, Louis Herrey and Richard Herrey. This song is amazing. It’s a great tune that makes listeners happy and start to dance… Here’s the lyrics and the chords so that you may play the tune yourself. The original song goes from E major, however this is kind a tough playing on a guitar, so I transposed it to C, which is much easier to play. 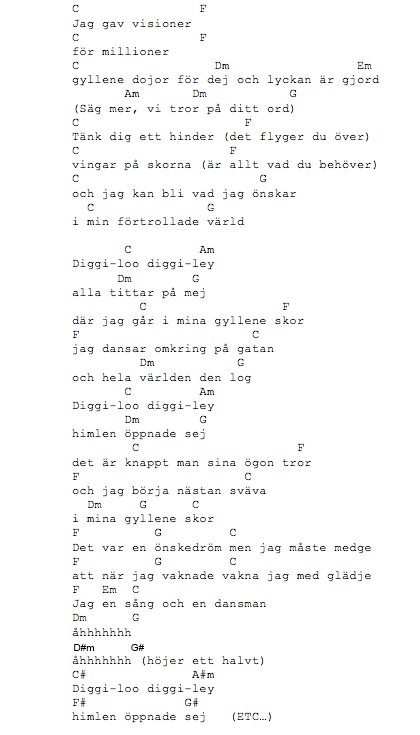 By the way, the english version is F major. You should check out my post with lyrics, chords and video for Happy New Year by ABBA. A great song. ← Sous vide – hvad er det og hvorfor er det så godt? 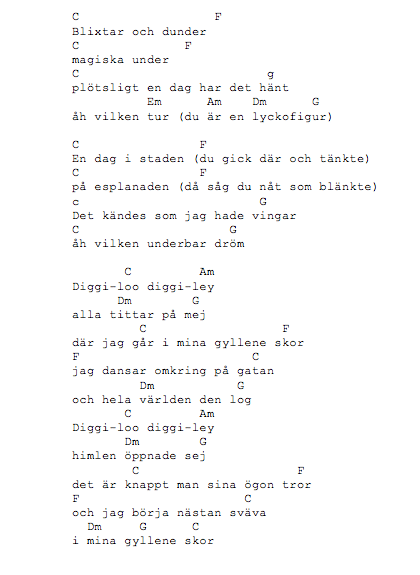 I really love this song and I have been trying to find the chord and lyrics on a simple homepage. All those crappy lyrics sites where you have to close 100s of popups etc.